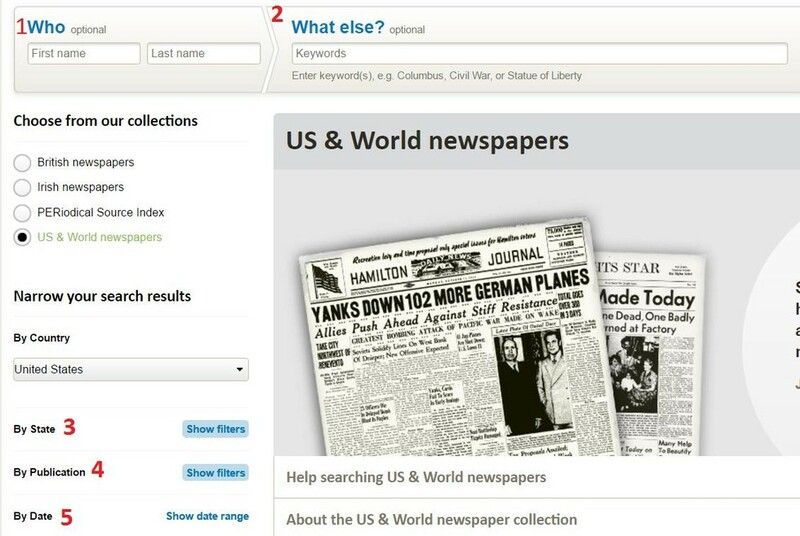 If you have never searched our US & World newspaper database before, read this handy guide and dive in. Newspapers are essential genealogical resources that are all too often overlooked by researchers. You can use them to track down locations of elusive official records, but you can also make amazing discoveries about the lives of your ancestors that you couldn't find in any other resource. Our newspaper search is located in the "search" drop-down menu found at the top of every page on our site. You will find our US & World newspaper database on the main search menu. Keep in mind, when you "search all records" that search does not include our newspaper database - it's a totally separate entity, so you'll need to search it individually. Once you're on the home search screen you'll see several options you to help refine your search. Let's take a quick look at each. 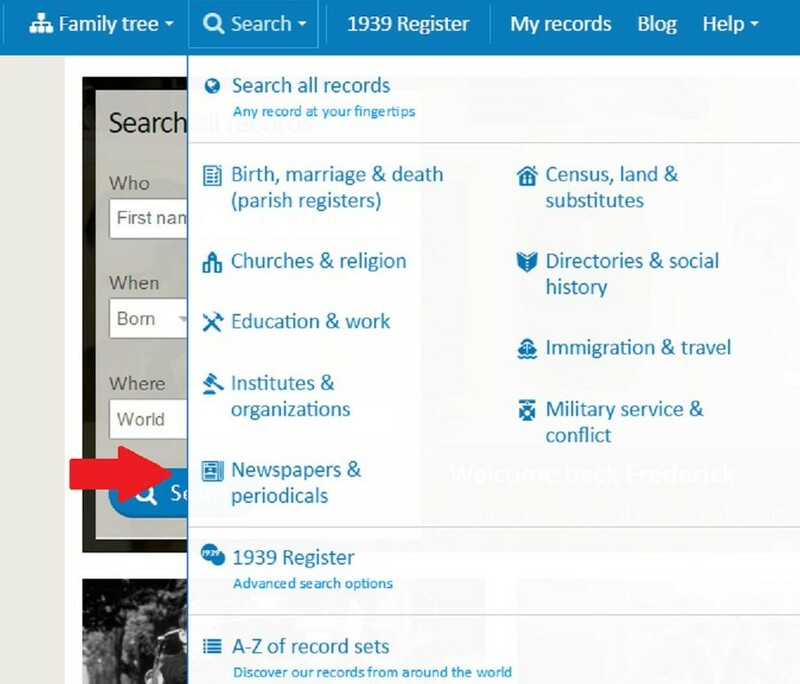 1. Who: If you're searching for a specific ancestor, this is where you would enter their first or last name. Note that all fields are optional. 2. What else? This is a keyword search. You can enter any word that you think will help refine your search - place, event, profession, etc. 3. 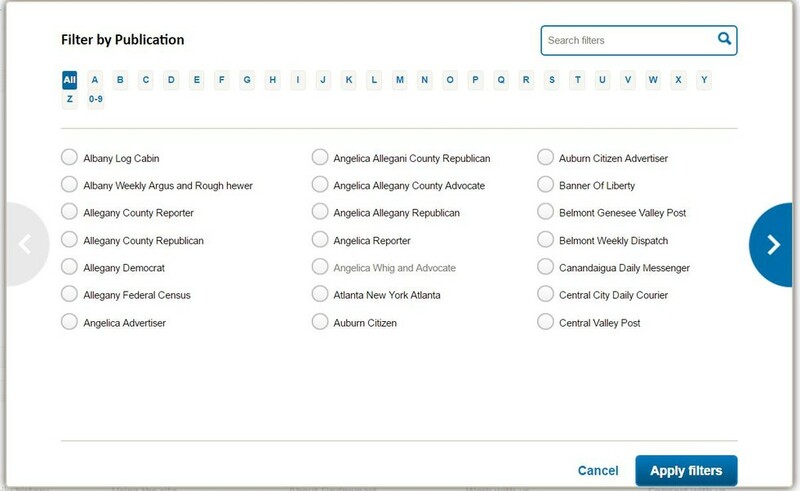 State: You are able to filter your newspaper searches by American states. We have newspapers for all 50 of them. 4. Publication: You can also filter by publication title. We have hundreds and hundreds of publications. 5. Date: You should always specify a date or a range of dates. When you click the "show filters" button, you will see this screen appear. Here, you are able to see all publications included in our collection. You can browse all of our publications or search in the upper right corner. If you're looking for something specific, you can search in the upper right corner. You can also browse alphabetically. This is a really powerful tool because it allows you to zero in on the publication that covers your ancestor's geographic area. For newspaper searches, you need to get specific - some US states might have so many publications that the search returns are unmanageable. For this situation, we recommend drilling down to a specific publication. Click the "show date range" button to get back results in a certain time period. 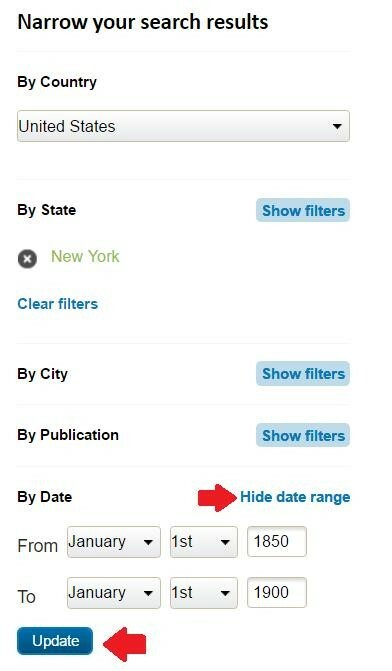 On Findmypast, you can search newspapers by entering a specific date and selecting +/- a certain number of years. You can also specify a specific date range by clicking the "show date range" link. 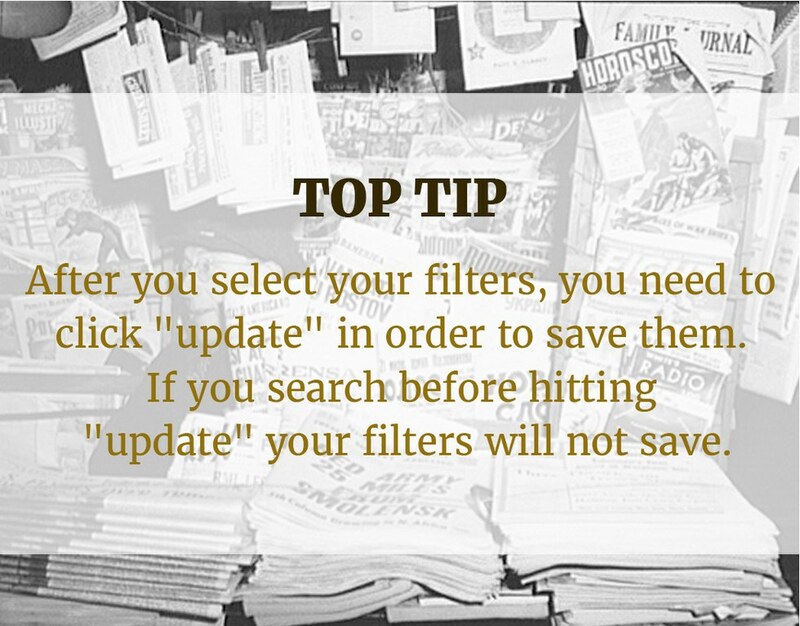 Because there are so many newspapers in our database, you don't want to begin with too broad of a search. We recommend going in with a detailed idea of who you're researching, where they lived and when they lived. Once you have your state and time period set, go for a last name only search first. Even if you're looking for someone specific, this is a good way to see the scope of your returns - if they're surprisingly sparse, you may have made some kind of error. If too many returns come back, then you can easily narrow down. And remember, you never know if an ancestor went by a different first name, middle name or nickname. You also may discover an event that included your ancestor, but didn't list them by name - for instance, a birth announcement may have their parents names but may not specify the new baby's first name. Make sure you don't ignore the "What Else?" search field. If you're searching for a specific piece of information, this is a very useful field to use. For instance, if you're looking for an obituary, you can include terms that would be commonly found in an obituary - death, deceased, funeral, etc. Remember, you don't have to include a name in the search. A fun and revealing way to use newspapers is to not search for your ancestors - instead, search for keywords like their neighbourhood, organisations they belonged to, occupations, or anything else that can help you understand their world. If your ancestors lived anywhere near a US state border, you definitely want to include those in your searching. Many newspapers covered events and served readers across state lines. For instance, newspapers in Pennsylvania and Ohio will be highly relevant to researching a family from western New York. But if you only use the New York state filter, you may miss out on some crucial finds. The ultimate thing you want to look for is the specific paper that covered your ancestor's hometown. Local news wasn't usually covered before about 1840 - but after this period, small town papers began to intensely focus on this subject. When filtering by publication, it's worth typing in the name of your ancestor's hometown in the search box - you may be delighted to see that their hometown paper was obviously named and available in our archives. If that doesn't work, you may need to do some research to see what publications covered the town of interest at a given time. Small town newspapers failed frequently, so it is quite possible multiple publications were around during your relative's lives. You can also use keywords to figure out what newspapers covered your ancestor's region. Include keywords like the name of the town, county or other location-based words.